Thiruvaiyaru is 13kms from Thanjavur situated on the banks of the river Kaveri1. It is the land of five rivers and is more renowned for its association with Saint Thyagaraja and the celebrated Ayyarappar or Panchanadeeswara temple. The presiding deity of the temple is Ayyarappar – 'the Lord of Five Rivers'. Another renowned feature of the place and the temple is, the great saint Thirunavukkarasar had sung on this deity. The present main shrine is the contribution of the Early Cholas and the temple complex also possesses two other distinct temples in it viz., the Uttarakailasa and the Dakshinakailasa, the former being constructed by Ulagamadevii, the queen of Rajaraja Chola and the later being by Panchavan Mahadevi, the queen of Rajendra Chola. The Saptamatha panel is on the innermost prakara of the Panchnadeesvara shrine. It lies to the south of the main shrine sanctum where the sculptures of Nayanmars are also present, Siva-Parvathi and the Navagriha are placed in the northern side of the same prakara. The seven mothers are carved as bas-relief sculptures guarded by Veerabadra on their right and Ganesa on their left. Except Ganesa the entire panel is carved on a single stone slab. Veerabadra, Brahmi, Maheswari, Kaumari, Vaishnavi, Varahi, Indrani, Chamundi and Ganesa are arranged consecutively. The sculptures of Veerabadra and Ganesa are much worn-out. 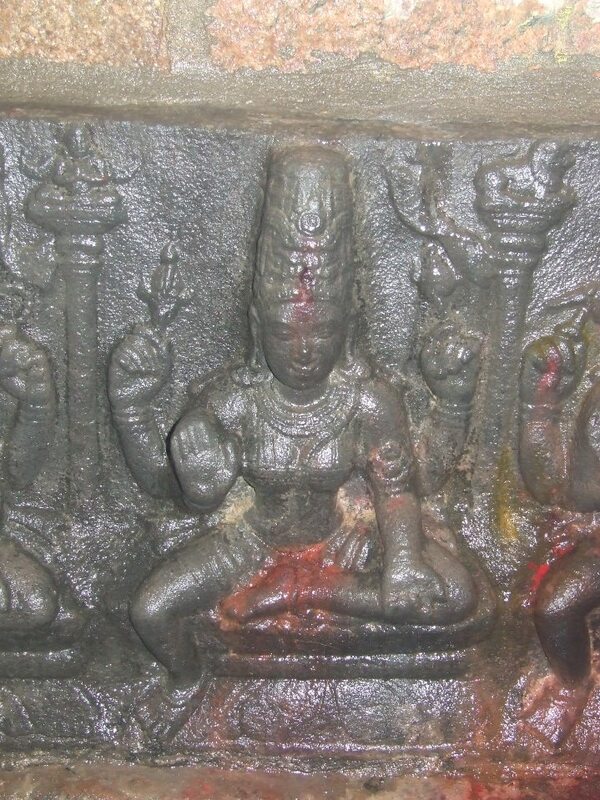 Veerabadra seated on a pedestal in suhasana with his front right hand in abhaya and the front left hand in varada whereas his back right hand carry axe and on the back left hand is skull bowl. His head is decorated as jatamakuta, ears are elongated and the right ear is adorned with patrakundala and the kundala in the left ear is not clear. Ganesa who is to the left of the mothers is seated in maharajalilasana on a round pedestal with his front left hand carrying motaka and back left hand is carrying tusk whereas the object in the right hands are not clear. Karanda makuta adorns his head and the trunk is left turned and holding a motaka. Udarabanda is shown. All the seven mothers are seated in suhasana on discretely carved padma pedestal which has both upward and downward flow of big petals. Though the mothers are represented with their distinctive weapons some of the features are uniformly depicted. Their front right hand is in abhaya and their front left hand is in kataka. As like, their back hands are in kataka and also carrying their distinctive weapons. All of them are wearing short attire with an idaikkattu above it. The hip belt that fastened around their lower garment is formed as a bow knot in the front. All of them have elongated ears adorned with kundalas. Charapali, yajnopavita, bangles, armlets and anklets are the other ornaments worn by them. Except Chamunda all are wearing a breast band. The armlet is either a snake coil or a coil with central patta. Kaumari is shown with channavera instead of yajnopavita. Udarabanda is absent in all. All the mothers are represented with their respective flag and the insignia on their right. The flag mast is a rudra pillar with the respective animal or bird of the goddess at its crest and a flag tied to the pillar. Brahmi or Nanmuki is represented first among the goddesses with swan as the insignia. Her visible three heads are decorated with jatamakuta. 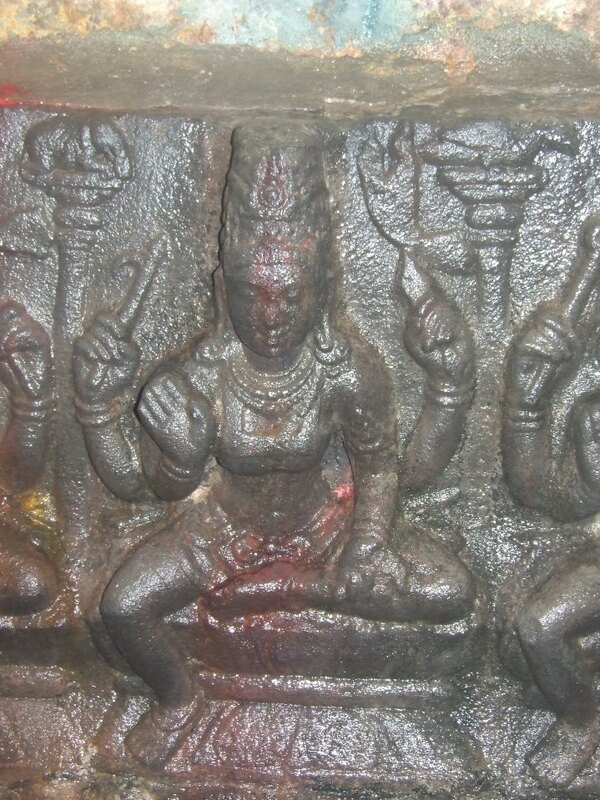 She has patrakundala and her back hands carry akshamala on the right and kamandalu on the left. Her vastra yajnopavita is shown with a heavy knot on the left shoulder. 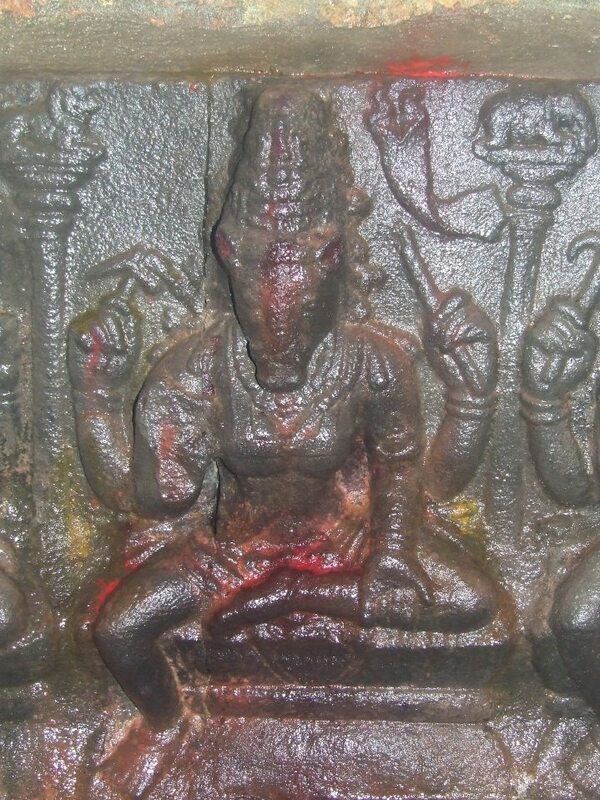 Next to her is Maheswari with jatamakuta with her back left hand carrying axe and right hand deer. 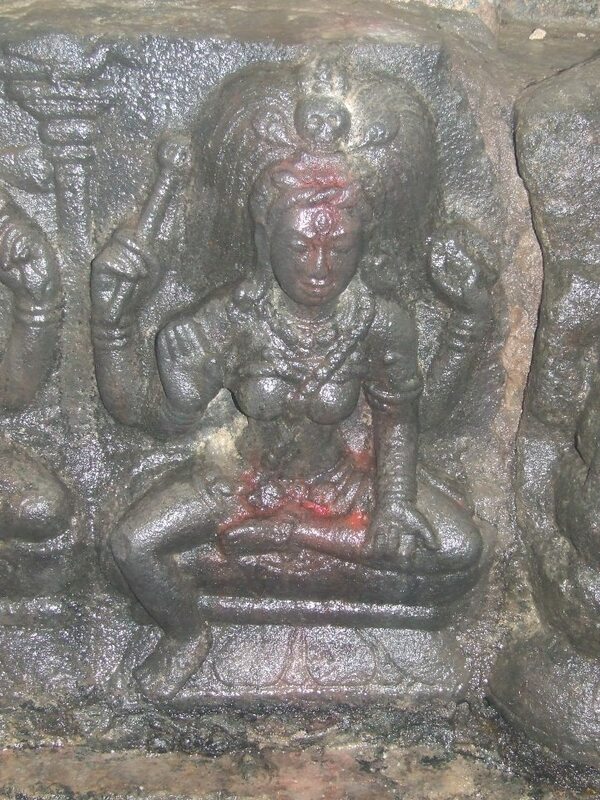 She is adorned with makara kundala on the right and pootukundala on the left. She is wearing vastara yajnopavita and armlet is snake coil. She is represented with nandhi. Next to Maheswari is Kaumari with Karantamakuta and chenni. She is represented with peacock. Her back hands carry akshamala in the left and sakti in the right. Both her ears are adorned with patrakundalas and her armlet is designed as snake coil. The channavera which she is wearing on the chest is beaded. Next to Kaumari is Vaishnavi with kritamakuta and her back hands carry chakra in prayoga fashion in the right and sangu in the left. She is adorned with makara kundalas and her armlet is simple coil with a patta. 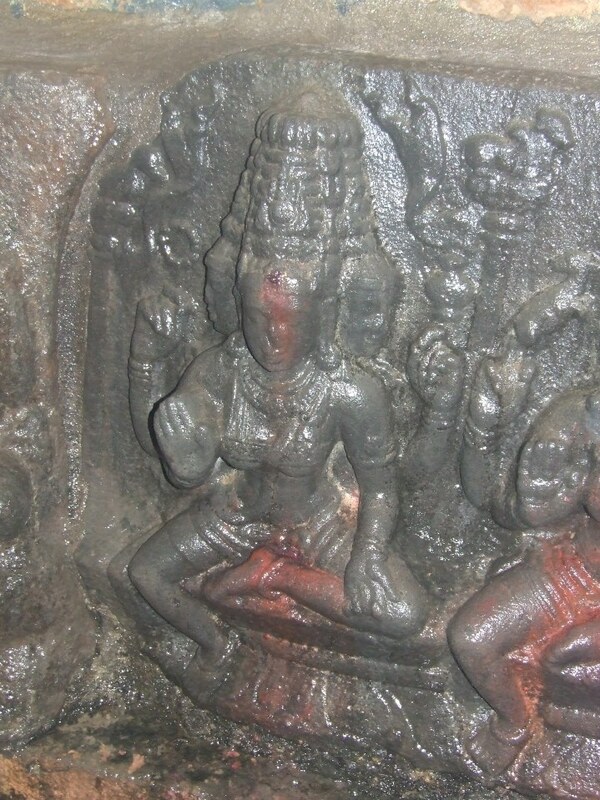 She is shown with garuda in seated posture with wings spread and hands in anjali. 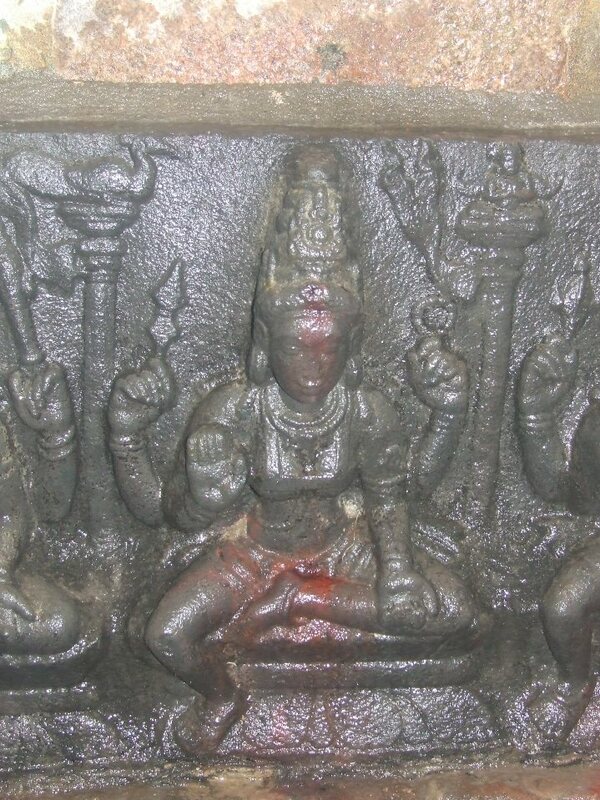 Next to Vaishnavi is Varahi with simha as her insignia. The lion with thick manes is seated on the pillar. Her back hands carry plough in the right and stick on the left. Her head is decorated as kritamakuta with flowing stresses. Both her yajnopavita and necklace are beaded. She is shown with the side tusks. Her front right hand is mutilated. Elephant is the insignia for Indirani. Her head is decorated as kritamakuta and her back hands carry elephant goad (Ankusa) on the right and sakti on the left. Her ears are adorned with makarakundalas. 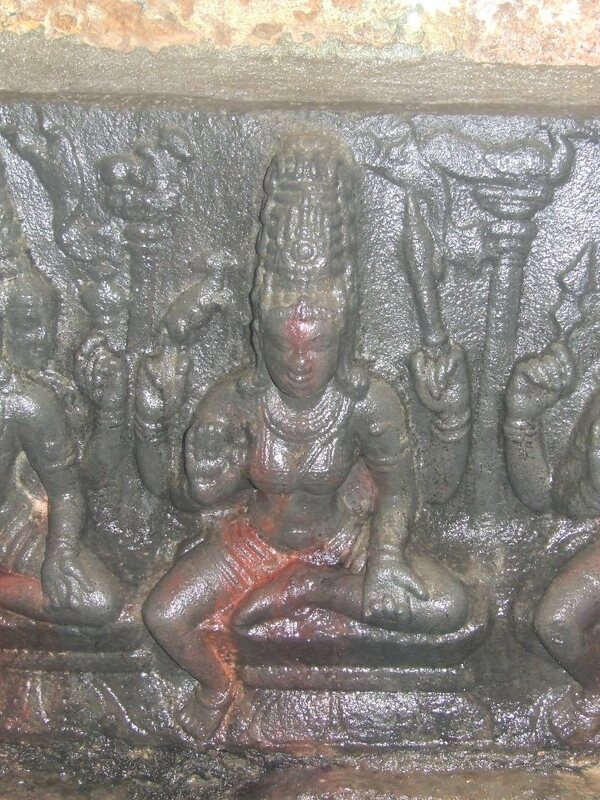 Among the seven goddesses Chamunda forms the last. Her intimidating portrayal is interesting one. Her ornaments are skull and snake. Head decorated as jatabhara with skull in the center and snake tiara. Her right ear is adorned with corpse kundala and left ear with patra and instead of breast band a snake is coiling her breasts. Her back hands carry sula on the right and skull bowl on the left. Her yajnopavita and neck ornament are skull garlands and her armlet is a snake coiled make. Salangai adorns her ankle. The center of her forehead is adorned with third eye. According to Dr. R.Kalaikkovan, Director, Dr. M.Rasamanikkanar Centre for Historical Research, Thiruchrirappalli, Silappathikaram is the first literary work to speak of the sapthamatha group. The above phrases give us a glimpse of Korravai and Kali. It hints that Kali was the youngest and there were six other elders. Silappathikaram also reveals the secondary position of Kali, as Korravai or Durga continued to be the prime goddess, a Sangam legacy. Even Korravai was overshadowed by Uma in the post-sangam period and given the status as consort of Siva overthrowing Korravai. As per Hindu mythology Kali was created to annihilate fiends and to epitomize Lord Siva’s supremacy in the art of Dance. Thevaram and Kariakkalammaiyar also speak about the greatness of Kali neglecting the six others2. The six elders being the female counterparts of Hindu Gods viz., Brahma (Brahmi), Siva (Maheswari), Vishnu (Vaishnavi), Muruga (Kaumari), Indra (Indrani) and Varaha (Varahi), the seventh one Kali remained a spinster. Though Silappathikaram introduced her as one among the seven goddesses, her individual identity has been revealed through the Thevaram. The religious literary tradition gradually personified Kali as leading female goddess. This led to the elimination of her from the Saptamatrikas and elevated her to the position of sole supreme goddess. The vacancy thus formed in the saptamatrika assemblage was later replaced by Chamunda that is indirectly gleaned through one of Appars pathigam. Chamunda was identified as the consort of Yama and was named Eyami inheriting the characterization of Kali. By the end of the sixth century A.D. the emergence of the stone architectural tradition gave way for the iconic representation of Saptamatrikas also in stone medium. Some of the earliest specimens of Saptamatrikas are at Thirukolakkudi (Sivaganga), Kunnathur (Madurai), Malayadipatti (Pudukkottai), Thirugokarnam (Pudukkottai), Parankunram (Madurai), and Kanchipuram3. 1. The article is based on the field trip on 08-01-2012. I thank Dr. R.Kalaikkovan for making the trip more enlightening and also thank other members of the team for sharing their views and ideas. 2. மு.நளினி, இரா.கலைக்கோவன், பெண் தெய்வ வழிபாடு தோற்றமும் வளர்ச்சியும், டாக்டர் மா.இராசமாணிக்கனார் வரலாற்றhய்வு மையம், திருச்சிராப்பள்ளி.